This was the big one, the first league meeting between the two sides, as soon as the fixture lists were announced, this was the first fixture everyone looked for (other than the obvious opening day) and to have it just 3 weeks into the season was fantastic. Weeks of preparation went into the game and it was antipated to be a good day however, the day didn't start well when bad traffic in Boston saw a 45 minute trip turn into an hour and a half. Upon entering the ground I found it a bit bland and that ever reliable "ready to fall down" look to it. 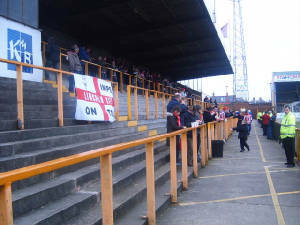 The away end was an average sized terrace and it provided an otherwise excellent view of the action, the only problem being the advertising boards prevented you from seeing the goal line. However, there was an excellent view of the other end of the pitch and you would be able to easily see if a goal on just managed to sneak over the line. 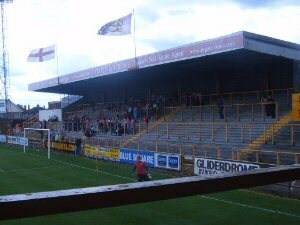 The stand to the Imps right was the main terrace at the Staffsmart Ground and the obvious preferable choice of the Boston folk. 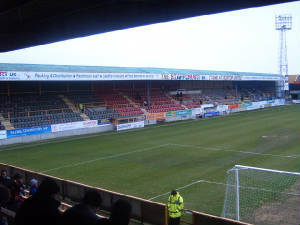 This terrace, although small ran the length of the pitch and I imagine it'd provide a relatively good view of the action. What extremely limited atmosphere the Boston fans produced came from this stand. 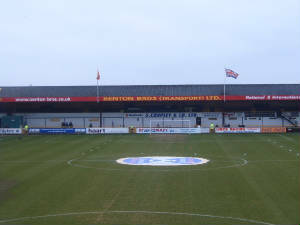 The stand behind the opposite goal was the oldest looking of the 4 with a small terraced section at the bottom with a wooden seated section above this. The final stand was an elevated seating. 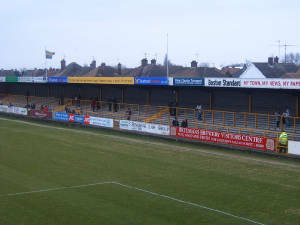 Another thing of note is that the Boston United dugout is a proper dug out with nice plastic seats that you'd find at Sincil Bank and everything but the away dugout was filled with those really hard chairs you get in primary schools, now that's hospitality for you. The programme was quite poor and wasn't really worth the £2 and perhaps was the cause of Boston worrying more about their points deduction during the summer rather than designing a new programme. Crowd trouble marred the whole game with several fans being arrested and one Lincoln fan being walked down the pitch with blood pouring after being hit over the head with something. That was about as much atmosphere as the game produced as it was quite a poor game with a bad atmosphere from both sides but Boston went on to win 2-0 which was deserved. Overall I didn't enjoy my trip to Boston, I found it a very uncomfortable position to be in because of the violence and it doesn't have the local derby feel and this didn't change down the years. 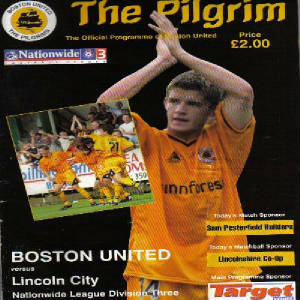 On our last League visit there (27/9/2006) Lincoln had more fans in the ground that the Boston fans did, perhaps that most evidence that this wasn't a true derby.